Iberian pure shoulder ham of acorn 5 Jotas, handcrafted by Sánchez Romero Carvajal. It is one of the most prestigious brands in our country , recommended for a good gift for lovers and palette of acorn. 5 Jotas Sánchez Romero Carvajal Shoulder Sliced. 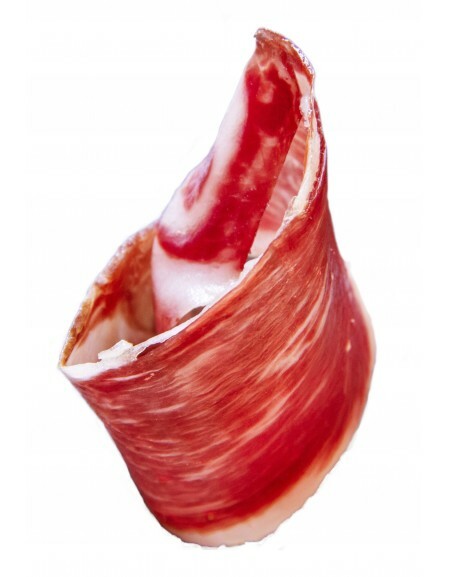 Iberian pure shoulder ham of acorn 5 Jotas handcrafted by Sánchez Romero Carvajal. It is one of the most prestigious brands in our country , recommended for a good gift for lovers and palette of acorn. Cinco Jotas Shoulder Ham is a rich and healthy product that forms part of the Mediterranean diet; our shoulder ham is from the front joint of pure Iberian pigs fed exclusively on acorns. Made from a selection of the best pure Iberian pigs, range-bred on the meadows of the Iberian Peninsula. The pigs receive exceptional care throughout their lives and are fed exclusively on acorns during the Montanera season. The acorns provide the animals with a high percentage of oleic acid which gives the loin ham features that have been scientifically proven as healthy. The Cinco Jotas loin ham helps reduce harmful cholesterol and is also rich in omega 3, omega 6 and omega 9.